Why My toilet Tank Wont fill. Home / Lakewood Ranch Plumber / Why My toilet Tank Wont fill. When you flush your toilet it should fill right back up. But when it doesn’t and just drips into the tank or doesn’t fill up until an hour later, the fill valve is probably the cause of your problem. The fill valve is located inside the toilet tank on the left side. Usually, the chemicals in our water cause the rubber parts to swell and/or deteriorate causing the fill valve to just drip when filling or very slowly fill the tank. Sometimes debri in the water lines will cause this same problem. The surest way to cure the problem is to replace the fill valve. There are many manufacturers of fill valves to choose from. Professional plumbers in Sarasota and Bradenton will normally install the fill valve manufactured by Fluidmaster. Most toilets today, come with Fluidmaster fill valves installed at the factory. 1) Go buy a fluidmaster fill valve and new supply line for your water closet. Check the condition of your flapper, this is a good time to replace it also. 2) Turn off the shut-off valve under the toilet. 3) Put a towel down under the shut-off valve area. 4) Flush the toilet to remove the water in the tank. 5) Remove the closet supply tube. 6) Remove the fill valve. ( Wimpy’s Plumbing uses a little bucket to catch the remaining water in the tank). 7) Assemble the new fill valve and install it in the tank. 8) Connect the new closet supply line. 9) Turn the water on and check for leaks. 10) Adjust the water level in the tank to the proper level. ( 1″ below the overflow tube). 11)Clean up your work area and make it neater than you found it, that’s what Wimpy’s would do. 12) Tell your spouse you fixed the toilet and be the hero and save money at the same time. 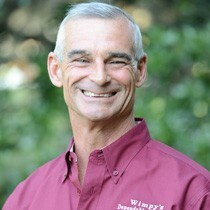 Should you have problems while performing this task, remember Wimpy’s Dependable Plumbing is available 24/7 to answer your questions or fix your plumbing for you with our fully stocked , super clean, service trucks with Florida state certified Master plumbers doing the work . Why do we do this? We want you to Love Your Plumber! Owner, Bubba Butler. Call 941-322-1911 or surf the web to www.LoveYourPlumber.com.